New York, NY (Top40 Charts) We have previously announced that several new features (and a full redesign!) are coming up in the new weeks/months. To follow our journey and get notified for interesting new features, you can sign up at our mailing list below. Subscriptions are handled via MailChimp and you can unsubscribe at any time. Your address will not be shared with any third party of be used for any other communication other than site announcements. Got any ideas for something that is missing from our site? 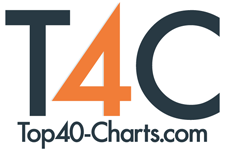 Contacts us at www@top40-charts.com.